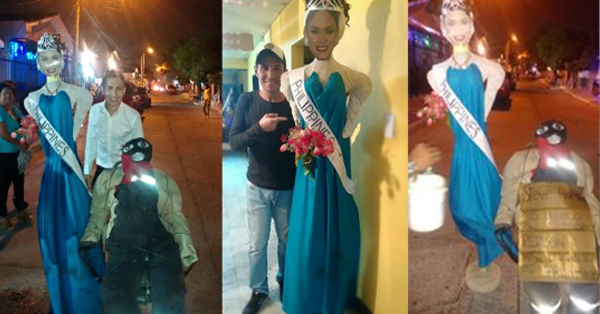 Controversial: Colombian Burns Down Pia Wurtzbach's Effigy on New Years Eve! After the controversial mixed up of the winner at the most recent Miss Universe that instead of Miss Philippines the host mistakenly announced Miss Colombia as Miss Universe that supposedly her place should be first runner up. Almost everyone talked about this matter and we can not deny that there are still people who haven't move on yet to what happened, especially to those country who are affected with it, Philippines and Colombia. Last new year's eve there is a video circulating the social media showing some Colombians who are burning a mannequin with a picture and costume of Miss Philippines Pia Wurtzbach and the host Mr.Steve Harvey. According to them, they believe that Miss Colombia really won that pageant and no one could replace that in their minds. stupid you guys,,,,you dont accept what really won..miss philippines is won for me...because shes nice and natural beauty...than other candidates,,,,like you miss colombia...why dont u accept you are lost....mr steve is a person... we person we commit mistake.go pia...you are beautiful with a heart..